Tucked away in a mini-mall on the corner of busy Venice Boulevard and Motor Avenue not far from Sony Studios, Mayura Indian Restaurant (10406 Venice Boulevard, Culver City, CA 90232, 310/559-9644) is a treasure. The restaurant is the love child of Padmini Aniyan and Aniyan Puthampurayil. 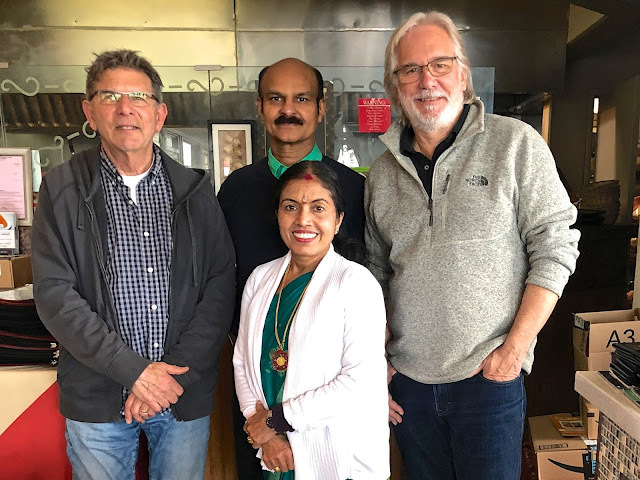 They moved from Kerala, a state on the Malabar Coast on the southern tip of India to Culver City and created Mayura to share their culinary heritage. A friend had returned from working in Atlanta for half a year. His text said, "I'm back. Let's eat. Someplace new. And good." Most of the places that fit that description were in DTLA or farther east. I live in the Palisades. Dean lives in Larchmont. So we wanted someplace in between. I skimmed through my restaurant lists. Nothing new and interesting. I looked online. Nothing looked good. I turned to Jonathan Gold's 101 Best Restaurants (2017). I scrolled and read and scrolled and read through a list of great restaurants. Many were dinner-only. Most were east of where we wanted to meet. When I reached number 98, I knew I had found what we were looking for. Mayura. Not that it was new. It wasn't. Well-established in the community, the restaurant has been a favorite for more than a decade. I emailed Dean Jonathan Gold's review. He read it and texted, "Ooo sounds great." After a trip to Malaysia and Singapore, I returned hungry for authentic South Indian food. When I was in Penang, Malaysia we ate many meals every day. We were on a culinary food tour created by the incomparable Muffie Fulton. 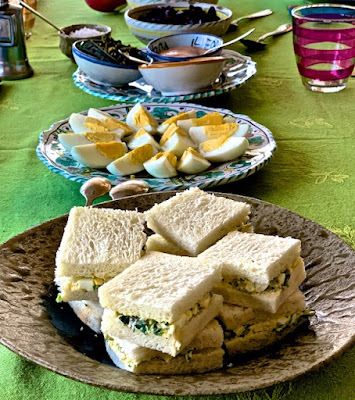 Her Bold Food offers tours to foodie-fun places around the world (Mexico, Japan, South America, Texas). 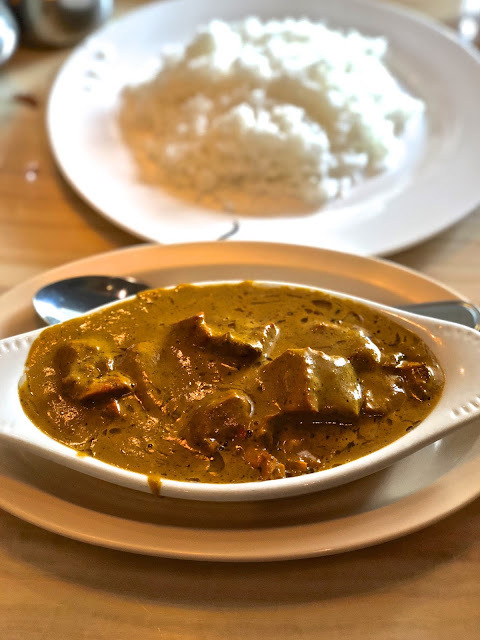 My favorite meals in Penang were in the South India district at open-air cafes and vegetarian restaurants in the heart of the commercial district. What I loved was the freshness of the ingredients, the excitement of the spices and the surprise of textures. That's what I missed. That's what I hoped to find at Mayura. The interior of the restaurant feels like home. 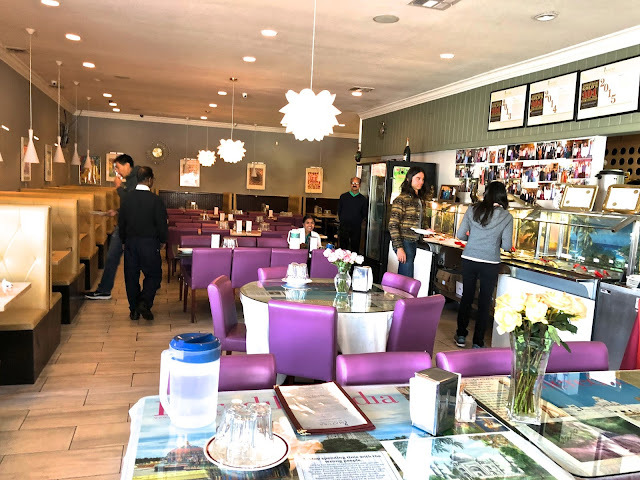 Cozy, cluttered, filled with plants and mementos of lives filled with family and smiling customers, the dining room has a row of plush banquettes on the left side, tables running down the middle of the room and a buffet that stretches half the length of the restaurant. Elegant in a turquoise sari, Padmini Aniyam, the gracious hostess and co-owner, greeted me and everyone who entered with a friendly smile. Aniyan Puthanpurayil waited at the side, directing a waiter to meet me at the table I wanted. The menu covered the range of classic South Indian dishes. 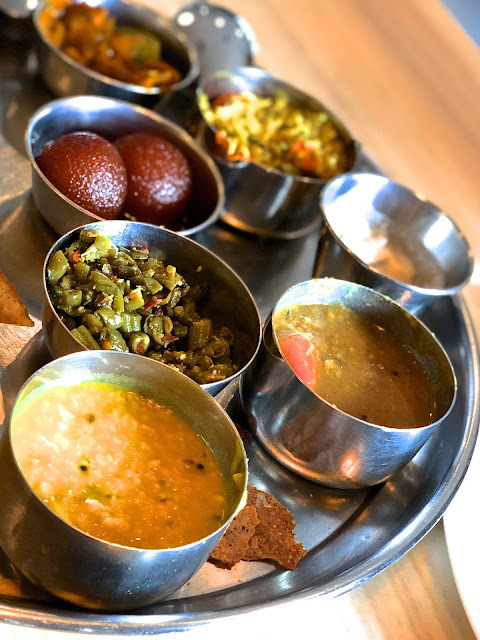 The lists of dishes filled five folio-paged sheets and included paper thin dosas, pancake round uthappams, potato filled samosas, crispy pakoras, donut shaped vadas, dark red tandoori, appetizers, soups, salads, breads, side orders and desserts. There were dishes with meat, chicken and fish. Vegetarian, vegan and gluten free dishes. With so many choices and some dishes I did not know, I was happy to have a friendly waiter willing to help us decide what to order. 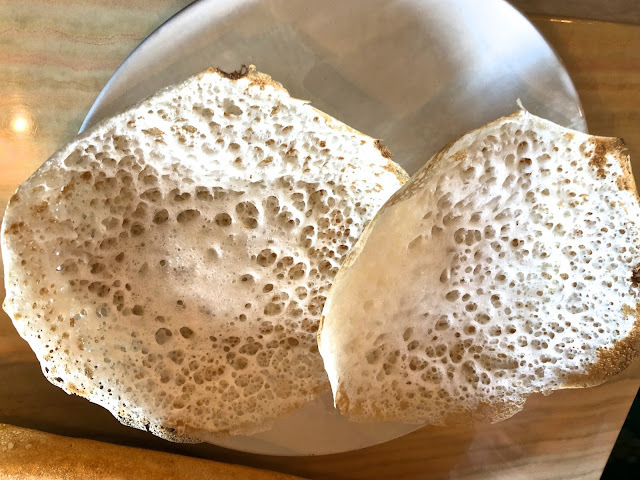 I was definitely interested in having a dosa, which I had loved when we ate at Woodlands Vegetarian Restaurant in Penang. I always love biriyani with shrimp or chicken. And the chicken curry looked good. Dean was running late so while I waited I ordered the Paper Dosa, the simplest of the half dozen dosas. Both Dean and the dosa arrived at the same time. 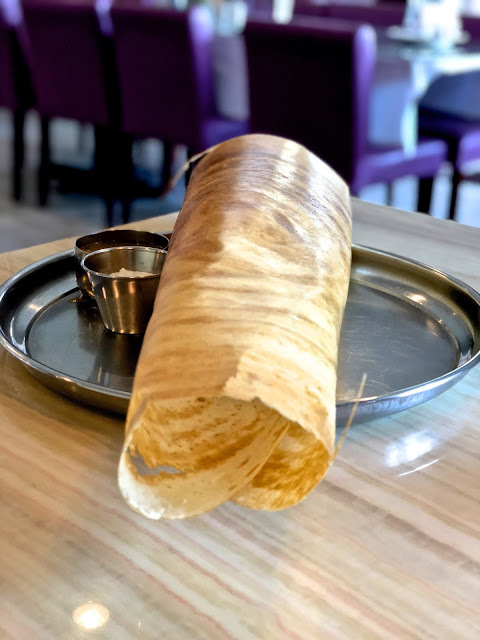 If you haven't enjoyed a dosa before, you are in for a visual treat. A batter is poured onto a hot griddle and cooked quickly. While the flat crisp is still hot, the sheet is rolled up. What arrives at the table is several feet long with a diameter of half a foot. Served with two dipping sauces, we dug in. She asked why I was taking photographs of the restaurant and the dosa. I explained that I am a food and travel writer. I could say no more. Before we could order from the menu, she walked to the buffet with a waiter and returned with plates of tastings. She insisted we try the fish curry to be eaten with the light-as-air, gluten free vada. 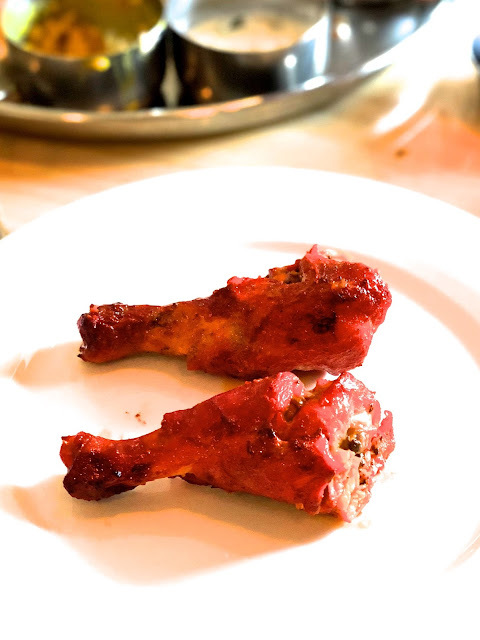 She arrived with a plate of chicken leg tandoori, a platter of chicken curry and fluffy white basmati rice, small metal bowls with half a dozen chutneys and a mixed vegetable pakora. Each dish was delicious. The tandoori was tender. The spices gave the moist meat an earthly edge. 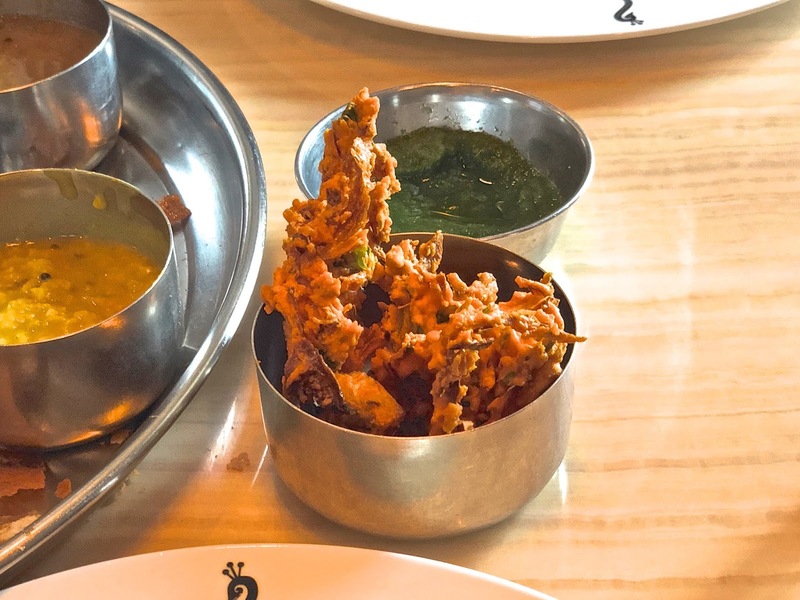 The pakora was light and crispy in every bite. I would never think of ordering fish curry but after a bite of the tender fish wrapped in a piece of the puffy vada, dipped in the light colored curry, I wanted more. One of my favorites dishes was very unexpected. Usually I am not a fan of okra. Too slimy. Not enough flavor. 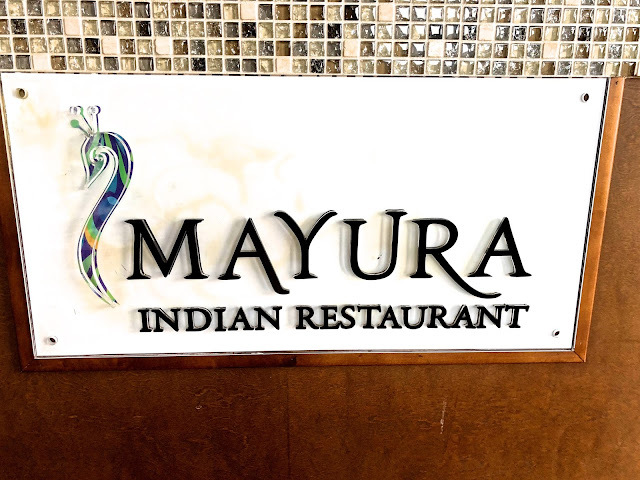 Not so at Mayura. The okra was simmered with onions and tomatoes. The slices of okra were softened and enveloped with spices. Heat-spicy and tender with a bit of crunch. Heaven. I loved the Bhindi Masala. Padmini asked if it was too hot for my liking. Not at all. We ate dish so quickly, I didn't take a photograph. On this first visit, we ate from the all-you-can-eat buffet. We never ordered from the menu. All the dishes we ate tasted as if they were freshly prepared, cooked just a moment before they were served to us. That is amazing. Before we left, we had to take a group photo to commemorate our first visit. Given the great number of dishes on the menu, I can hardly wait to go back. In fact, we are going back to today!